A recent Forbes article paints a grim picture of employee happiness. Even though the US is doing better than much of the world, only 30% of people are happy with their work. Given that a happy programmer is a productive programmer, you’d hope that managers in the software world would be doing whatever they could to keep their fingers on the pulse of employee happiness. Talking with my peers continues to prove that this isn’t the case. Most of their managers have no idea how unhappy their employees are. At Terrible Labs, we’re invested in the happiness of our coworkers. Jeremy and I recently spent an afternoon building a simple Rails app to help us gauge the mood of the company. This iPad lives in the kitchen. 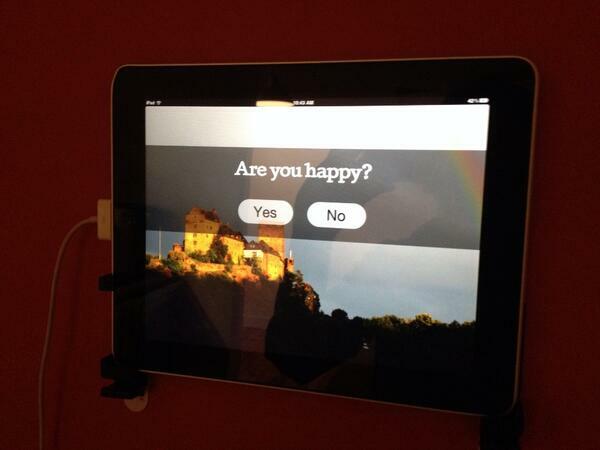 The background cycles through popular nature photos from Flickr and prominently asks “Are you happy?” You simply tap “Yes” or “No” and your answer is recorded anonymously. You’re rewarded and inspired with a random Star Trek or Simpsons quote after answering. If you’d like to be even more anonymous, just load up the web app in your local browser and answer without a crowd. According to the first few weeks of usage, we’re happy 81.7% of the time. That’s promising, but we’re going to look at the data over time to get a sense of mood. Are we improving? Are things getting worse? Are people happier on different days of the week, times of day, or times of year? This data doesn’t answer the question of what we should do differently – that’s where the hard work starts. It also isn’t a substitute for regularly meeting with employees and asking them how things are going. The metrics here are only another data point to be considered with the whole. 30% of Americans may claim to be happy with their job, but some portion of that percent is probably just happy to have a job in this recovering economy. In the world of software, your employees are spammed by recruiters several times a day and could trip over three more jobs on the way home from work. We have to try harder. Good developers already have the bottom sections of Maslow’s Hierarchy of Needs under control and are looking for esteem, achievement, and self-actualization. If you can’t keep them engaged and help them achieve those things, they’ll look elsewhere (see also: Bored people quit). Are your employees happy? Do you have any idea? Find out. The code to our (very simple) app is here on GitHub. The README has all you need to get it running on Heroku and collecting data.